Dr. Qingjun (Joan) Li is a native from mainland China. She received her B.A. in English from Zhengzhou University, P.R. China and M.A.in English from Belmont University. She holds a Ph.D. in English from Middle Tennessee State University. Her dissertation, entitled “Emerging Trends and Voices in Maxine Hong Kingston Criticism: The Woman Warrior and China Men in Recent Scholarship in Mainland China,” focuses specifically on an analysis and comparative study of the reception and interpretations of Maxine Hong Kingston’s The Woman Warrior and China Men in current mainland Chinese scholarship. Prior to coming to the U.S., she was Associate Professor of English at Zhengzhou University, where she was twice recognized as University Teacher of Excellence. 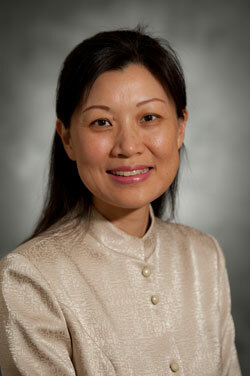 At Belmont, Dr. Li is an Associate Professsor and teaches courses both in Asian Studies and Chinese language. She was named 2014-2015 Virginia M. Chaney Distinguished Professor. In 2014, she was a recipient of an ASIANetwork Freeman Student-Faculty Research Fellowship grant and led a team of four Belmont students to do research in China on the “Commodification of Culture in China’s New Cultural Industry.” Her recent students have received Chinese Government Scholarships, Hanban Confucius Institute Scholarships, U.S. Critical Language Scholarships, and one of her students is a current Fulbright Scholar in Taiwan. Others of her students are either teaching English or pursuing graduate degrees in China or in the U.S.. She is the advisor of Chinese Cultural Club at Belmont and has served as Co-Director for Belmont’s China study abroad programs for ten years, having taken over 200 students to China. Take me to Dr. Li's website.